What may seem like harmless lifestyle habits may really be robbing you of your get-up-and-go. Let's face it: we all get more fatigued as we get older. It's part of the aging process: we lose mitochondria (energy-producing engines in the cells) and we produce less adenosine triphosphate (ATP) — the molecule that delivers energy to cells throughout our body. Other causes of fatigue, such as medication side effects or chronic illness like depression or heart disease, can increase the feeling of tiredness or sluggishness. But age- and disease-related factors aren't the only drains on your energy. 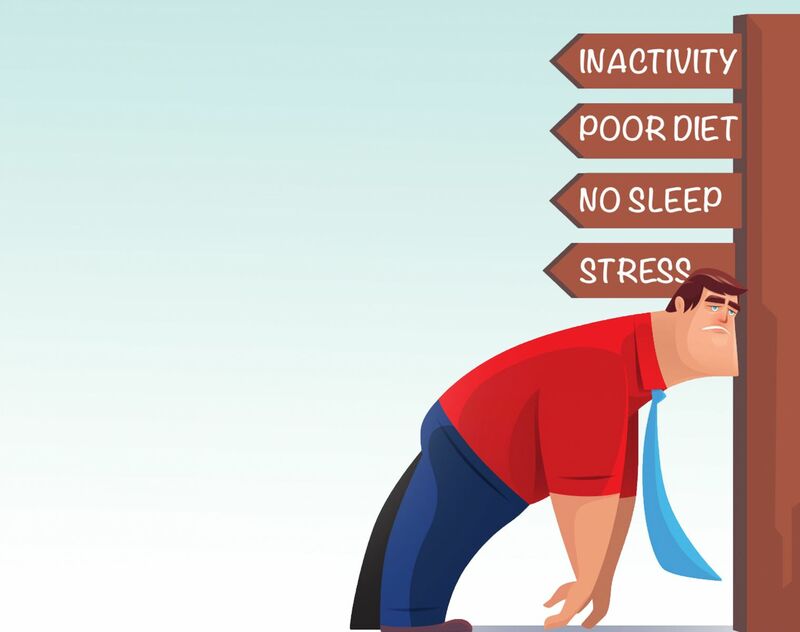 Your lifestyle habits may be to blame for some of your daily fatigue. The following energy zappers are common culprits that you can change. We naturally lose muscle mass as we age. "If you have less muscle mass, you have fewer mitochondria and less ATP," points out Dr. Marcelo Campos, a primary care physician with Harvard Vanguard Medical Associates in Boston. Being sedentary compounds the problem by weakening and shrinking muscles and causing them to use energy inefficiently. Physical activity strengthens muscles, helps them become more efficient and conserve ATP, and increases the production of energy-producing brain chemicals. Don't be intimidated by the recommendation of 30 minutes per day, at least five days per week, of moderate-intensity exercise. The 30 minutes can be spread out into several shorter periods. And you don't need to break a sweat. "Whatever exercise you can do will help," Dr. Campos says. "It can be simple, like climbing stairs or walking farther in a parking lot." Chronic stress can increase levels of cortisol, a hormone produced by the adrenal glands. "Cortisol reduces production of ATP and it increases inflammation, which also reduces ATP production," explains Dr. Campos. However, stress-reduction techniques are associated with lower cortisol levels. Try yoga, mindfulness meditation, tai chi, breathing exercises, or guided imagery. Even 10 minutes per day can help. If you're not nourishing your body, you won't have the vitamins and minerals necessary to produce enough ATP, and you'll feel more tired. "Eating too much processed food can increase inflammation, which impairs the production of ATP and energy. Or, if you're older and your appetite isn't what it used to be, you may not give your body the calories and fuel it needs to function," Dr. Campos explains. On the flip side, if you're eating too much food at one time, that can cause blood sugar spikes and lead to fatigue. The fix: eat whole foods, including vegetables, fruits, whole grains, and lean proteins like fish, chicken, nuts, and seeds. The fatty acids in protein-rich foods also help boost ATP. And aim for smaller meals with snacks in between to provide your body with a steady supply of nutrients and fewer blood sugar spikes. A lack of sleep increases cortisol and also promotes inflammation. If sleep issues are caused by sleep apnea (pauses in breathing during sleep), the dips in blood oxygen levels lowers ATP and energy. Talk to your doctor about underlying problems that may rob you of sleep, such as health conditions (sleep apnea or frequent trips to the bathroom) or medication side effects. And work on improving sleep hygiene: go to bed and wake up at the same time each day, and keep your room cool, quiet, and free of electronics, which stimulate your brain. Drinking sugary sodas can cause blood sugar spikes followed by a drop that causes fatigue. Being dehydrated can also make you feel tired, as can drinking too much alcohol or caffeinated drinks near bedtime (alcohol interrupts sleep in the middle of the night). Healthy people need six to eight cups of fluid per day, and more if they're exercising. Avoid soda. "And stop drinking caffeine or alcohol within six to eight hours of bed," Dr. Campos advises. Being isolated — not seeing others on a regular basis — is associated with depression, and depression is linked to fatigue. "The power of interacting with other human beings and connecting with others can bring a different outlook and give you more energy. We are learning more about this. We probably produce different types of brain chemicals that make us happier and give us more energy when we connect to people," Dr. Campos says. Resolve to get together with others at least once per week. It can be friends, family, neighbors, or even new acquaintances. When is low energy a problem? "If fatigue is affecting your day," says Dr. Campos, "or if fatigue is accompanied by any other symptoms like headache, muscle or joint pain, fever, or stomach or urinary problems, it's time to see your doctor."